The big news for us is that we have booked a 'holiday of a lifetime' for March/April 2010! We were originally hoping to do an Alaskan cruise in the summer with Michael W Smith, a Christian Singer, but Shanhong's change of job has meant the dates do not fit with our holidays. But, when God closes one door, he opens another - and we are now booked on a trip that should prove to be every bit as exciting! (Oops - can't find the 2010 advert - so you'll have to look at the 2011 one!). We are joining others from New Creation Church in Singapore and worship leaders Bob and Kathy Fitts from USA for an Easter tour of Israel and Jordan, following in the footsteps of Jesus. New Creation Church has become our home church here in Singapore and we have been attending for around 6 months now. The Senior Pastor, Joseph Prince, is a very humorous and charismatic speaker and his messages are entertaining, whilst also challenging. The church focus is on the finished work of Jesus and the unmerited favour and grace of God. Interestingly, services are recorded and shown throughout the world on Christian television. When I was home for Christmas I discovered that 'Destined to Reign' broadcast live from our church, was even available in the UK through Sky! Bob Fitts is perhaps best known for the song 'Blessed be the Lord God Almighty' but has been writing songs and leading worship for many years. We had the privilege of attending a worship concert led by Bob and Kathy Fitts while teaching at Prem in Chiang Mai in 2008. The tour takes in the most famous biblical sites throughout Israel and Jordan with teaching and worship in each location. It is not cheap, but I believe it is a holiday that will stay in our hearts for a long time, and look forward to writing more reports with photographs once we return. For now, I can only supply the itinerary , but that in itself is pretty exciting, especially to anyone who shares the Christian faith with us. No other news at present. I am busy at school - including a Grade 7 sleepover Friday night, and exam results being released on Monday. Shanhong has had a week in her new school setting up her classroom, meeting other staff and attending training - students start tomorrow. So far she seems much happier than she was at SJI, so I am hopeful that life is going to be good for both of us. I've finished two more modules of my degree - and submitted a dissertation proposal - so that is still moving forward too. We are still enjoying the pool and having fun with the Wii - so, getting a bit of exercise at last. You never know, we might lose some weight - but maybe not when you see all the chocolate and snacks in the fridge. 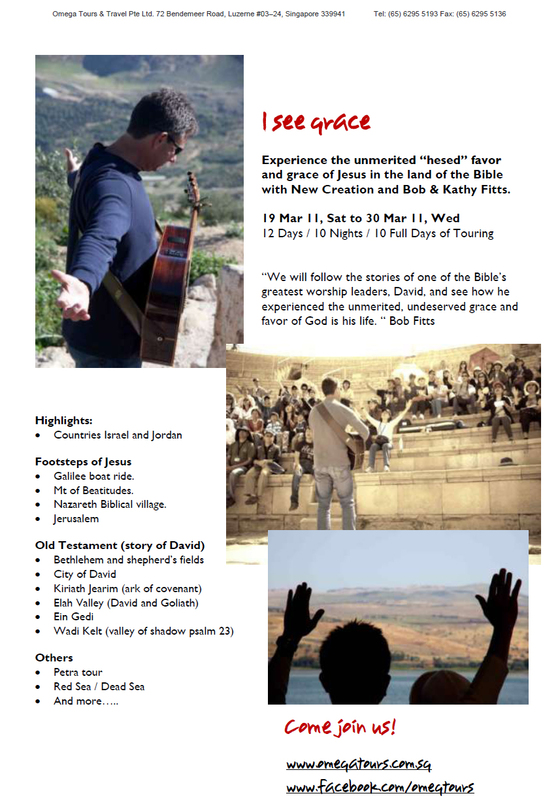 In the Footsteps of Jesus – 29th March – 9th April. Fly from Singapore via Qatar (with a 3 hour city tour in Doha) to Jordan.Visit Mount Nebo, where according to Deuteronomy 32, Moses was given a view of the Promised Land. Visit Bethany, where Jesus was baptized by John the Baptist, and Elijah’s mount, where the prophet Elijah ascended to heaven in a whirlwind on a chariot of fire. Drive on to Petra, a spectacular ancient city nestled in mountains south of the Dead Sea.Enter the city by donkey into the ancient land of the Edomites, and enjoy the spectacular structures carved into the rock, made famous in the movie ‘Indiana Jones and the Last Crusade’. Cross over into Israel at the Red Sea and visit: Eilat – referred to as Elath in the Old Testament, this is a port and holiday destination on the Red Sea.Timna National Park – including the Wilderness Tabernacle, a reconstruction of the Old Testament tabernacle, King Solomon’s Pillars, and other sites. Mount Sodom – One of the prominent cities of old destroyed by Yahweh with fire and brimstone. Ein Gedi – an oasis by the Dead Sea which was David’s refuge when he fled from King Saul. Today we also get to swim in the Dead Sea – where anyone and everyone floats! Jewish history day – with visits to the Israel Museum, Holyland Model, Holocaust Museum and the caves of Qumran where the Dead Sea Scrolls were discovered in 1947. A Day in Bethlehem, the birthplace of Jesus and of David.A visit to the Upper Room where Jesus celebrated the last Passover with his disciples and a visit to the house of Caiaphas where Peter denied the Lord three times. A visit to the temple mount to see one of the most sacred sites of the Christian, Jewish and Islamic religions – including the Wailing Wall – which is broadcast live on the internet 24 hours a day – maybe you’ll catch a glimpse of us! To Nazareth – where Jesus spent his boyhood, and to Cana in Galilee where Jesus turned the water into wine. A boat trip on the Sea of Galilee where Jesus rebuked the storm and walked on water – followed by the retun to Jordan, for an afternoon flight back to Oman, and onward to Singapore.